Description : yoName turns your computer into a private detective. Look for anyone you want. You can even look them up by a username or an email address! 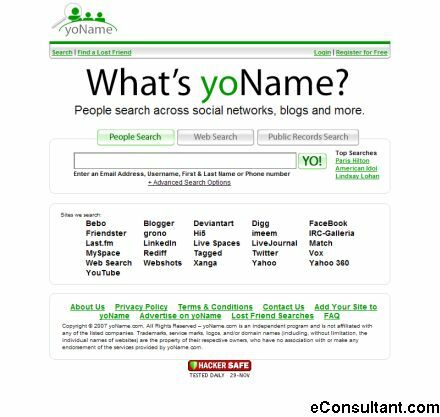 If they’re on any of the big-time networks like MySpace or Facebook, yoName will find them. Look up friends, family, ex-es. Look up yourself and see if someone’s impersonating you. Or just have fun and look up celebrities, even if the first five entries for Paris Hilton are all "male, 39, single, in Madison, Wisconsin".